On behalf of the officers at AAMEP we would like to thank you for your support. We have prepared a very exciting program with interesting presentations and live demonstrations. We are confident you will find the information educational, stimulating, and FUN! 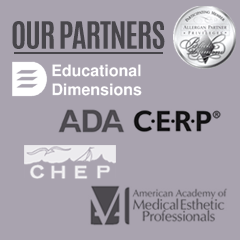 We are proud to offer 9.5 CE’s and CME’s for attending the 7th Annual AAMEP conference. We wish you great success in your medical esthetic practices. We are looking to fill the position for the State Chairman for your state. In light of what is going on all over the country with the Dermatology community trying to inhibit and prohibit our practice of esthetics by their attempts to introduce legislation (to limit and restrict), we need now more than ever to have active participants and responsible communicators. We are asking for your commitment to your organization to assist and work with your fellow members to strengthen and nurture our organization for the good of all members. This will not take up much of your time; only a few hours per month to keep abreast of any new bills that may have been introduced to your House of Representatives and State Senate. You will have direct communication with your Regional Director and President of AAMEP. Opportunities for involvement are greatly welcomed. Your energy and presence are needed in committees, Workgroups, and Task Forces. The AAMEP board of Directors is here to serve you. Our continued goal is to implement state and national coalitions to collectively address priority Association issues: legislative changes, the scope of practice, membership recruitment, malpractice insurance needs, and more. Please let us know your interest. 4:00 Sasha Parker, MEP-C The Many Amazing Uses of Platelet Rich Plasma and conference wrap up! SASHA PARKER RN, MEP-C, President AAMEP– Board Chairman, Founding Member; Sasha Parker is the President and Founder of Esthetic Skin Institute, Inc and was the original innovator and 1st trainer of “medical esthetic hands-on” workshops” and has personally trained thousands of medical professionals internationally for over 13 years. She has trained with many medical esthetic experts throughout the world and has a passion for sharing that knowledge with colleagues. Sasha Parker: The Many Amazing Uses of PRP -Platelet Rich Plasma has been used in Europe with great success in clinical practice since the late 1980’s. Initially used to enhance wound healing in many specialties, it’s emergence into the aesthetic/cosmetic arena for rejuvenation of skin started in 2004. The Skin rejuvenation technique has been used since 2004 in Europe, Asia, and South America. Patients have seen all around improvement in skin texture, pigmentation disorders, fine lines and wrinkles, scars, acne, stretch marks, and hair loss to name a few. Studies show that PRP, when done properly, has the ability to increase collagen deposition and remodeling which can persist over a 12 month period. The term autologous means that the source of origin is the patient’s own body and because of this is desirable to many patients who may desire a natural type treatment. ELIOT F. BATTLE, JR, MD; Dr. Battle is considered one of the world’s best cosmetic dermatologists and laser surgeons and recognized as the leading authority of cosmetic laser therapy on people of color. His 3-year pioneering research at Harvard helped to invent the new generation of non-invasive “color blind” cosmetic lasers opening up the field to patients of all cultures, regardless of the skin of color or ethnicity. Eliot Battle, MD will be discussing the current trends in treating skin of color. This discussion has been developed in response to the ever-increasing demand for dermatologic treatments in patients with skin of color, and the accompanying need for education and training in this quickly expanding market. CHERYL WHITMAN, CEO BEAUTIFUL FOREVER AESTHETIC BUSINESS CONSULTING CHERYL WHITMAN IS AN INTERNATIONALLY RECOGNIZED PIONEER IN MEDICAL SPA AND AESTHETIC MEDICAL BUSINESS CONSULTING. CHERYL IS A PUBLISHED AUTHOR, POPULAR SPEAKER AND COSMETIC MARKETING SPECIALIST. AS FOUNDER AND CEO OF BEAUTIFUL FOREVER, CHERYL SPEARHEADS A SUCCESSFUL TEAM OF AESTHETIC BUSINESS CONSULTANTS AND BUSINESS PROFESSIONALS. Cheryl’s diverse background enables her to provide her clients with the highest level of personal attention, along with top-notch consulting support. Frequently quoted by news media such as the New York Times and a host of industry trade journals, she has worked with clients helping them to improve their business practices and their bottom lines. Cheryl Whitman Develop Your Customer Service Skills- Learn how to successfully deal with the 6 different types of clients. Cheryl will discuss learning how to properly and effectively manage your relationships with the new patient, the undecided patient, the difficult patient, the negotiating patient, the shopper, and the VIP. Shino Bay Aguilera, MD Dr. Shino Bay Aguilera is a world renowned Cosmetic Dermatologist, Dermatologic Surgeon, Cosmetic Laser Expert, and is Dual Board certified with a Fellowship in Dermatology from the American College of Osteopathic Dermatology. He has over 16 years of ongoing advanced training in lasers and Aesthetics and is a clinical researcher, publisher, and Medical Director of NOVA University Dermatology residency program and Assistant Professor of Dermatology for four other Universities. A top-requested International physician trainer and keynote speaker, Dr. Aguilera travels the world teaching physicians the proper use of the newest laser advances and cosmetic techniques. Dr. Shino Bay Aguilera Will be discussing treatment protocols for the most optimal use of Sculptra Aesthetic for enhancement and volumization. Dr. Aguilera is the Number one Sculptra user in the United States and is a world speaker on this topic. He will also do a live demo. Tanya Bower, ESQ a director with Tripp Scott Firm, focuses her practice on corporate and tax matters, including estate planning, asset protection and wealth preservation. She counsels owners of closely-held businesses on estate-planning matters and helps clients in a wide range of businesses on ERISA matters, including establishing, amending and terminating pension plans. In addition, she is experienced at drafting corporate contracts and other documents; establishing and dissolving corporations, limited-liability companies and partnerships; and representing owners in acquisitions and mergers, including analyzing the tax aspects of these transactions. Tanya Bower, ESQ, PA will be discussing Asset Protection “Now that you’ve made it, don’t lose it!” Tonya will address important topics such as tax liabilities, separating your assets, assets exempt from creditors, assets owned by entities, estate planning and more. With a question and answer period for attendees. Now is your chance for free legal advice. Janelle Vega, MD is a board certified dermatologist and received her undergraduate degree from Haverford College in 2002, followed by an M.D. degree in Gainesville, FL from the University of Florida College of Medicine in 2006. She completed a post-doctoral training in Internal Medicine at Beth Israel Deaconess Medical Center in Boston, a Harvard medical school affiliate. She also did a year of clinical research at the University of Puerto Rico where she also fulfilled her first year of dermatology training. She concluded her dermatologic training at the University of Miami Miller School of Medicine, where she received an award for Excellence in Dermatologic Surgery. She is the author of several medical articles and book chapters. Janelle Vega, MD is speaking about Skin Rejuvenation with Sublative fractionated bi-polar radio frequency technology which places the heat energy effectively into the upper dermis where it can produce a significant increase in both collagen and elastin with minimal epidermal disruption. Leslie Blanche As a senior healthcare marketing manager with HRB, Leslie brings experience working in the medical marketing field. Leslie specializes in working closely with hospitals, device companies and physician practices to hone and develop their personal philosophy into a distinct and identifiable message that will help them earn the trust of their communities and industries and, ultimately, to help them grow. She has implemented successful marketing campaigns for physicians and hospitals across the US and Canada. Stephen Holt, MD Integrative Medicine is a best-selling author and medical practitioner in New York. He has been described as a visionary, a pioneer of Integrative Medicine and is world-renowned for his work on nutrition and dietary supplements. He is a frequent guest lecturer at medical and scientific conferences. For many years, Dr. Holt has developed management pathways for several public health initiatives, with an emphasis on lifestyle changes and nutritional interventions. He believes that healthcare should be portable, widely available and free for children and the elderly. Dr. Holt has been described as the “doctor’s doctor” because many of his patients are medical practitioners. Because of the major pressure on Dr. Holt’s time as an international lecturer etc., he restricts his patient care to referrals only from other doctors. Dr. Holt’s principal training has been in allopathic medicine, but he has charted new treatment paradigms using natural medicines. He believes in the concept of “medical pluralism”, where many different medical disciplines come together to provide holistic healthcare. Dr. Holt supports the practice of many forms of medicine including chiropractic medicine, naturopathic medicine, podiatric medicine, homeopathic medicine, as well as traditional medical disciplines that offer many alternative strategies for health maintenance. He is an author of more than 20 books in the popular healthcare field and he has also contributed chapters and many articles to peer-reviewed medical textbooks and journals. As well as publishing several hundred scientific articles in leading medical journals, Dr. Holt has been cited thousands of times in the medical and lay press. An Honors graduate in medicine from Liverpool University Medical School, in England, UK, Dr. Holt holds sub-specialty qualifications in gastroenterology and internal medicine in the USA, Canada and Europe. He has practiced clinical medicine for four decades. Dr. Holt has held the rank of full professor of medicine and bioengineering (adjunct) for many years and he has received awards for medical teaching and research, in the United States, China, Indonesia, Great Britain, Malaysia, Thailand, Taiwan, South Korea and other countries, where he has served as a Visiting Professor. He now holds the highest academic rank as a Distinguished Professor of Medicine (Emeritus). Dr. Holt was the recipient of an honorary appointment as a Professor of medicine at San Yat-sen University of Medical Sciences in China, an honor bestowed on only a small number of Western physicians. In 2005, Dr. Holt was honored with the degree of Doctor of Humane Letters for his contributions to education in medicine. He has been knighted by the Holy Order of St. John and serves as their Lieutenant Grand Hospitaller.